The world’s fastest four-door car has sped from the record books to the Jaguar stand at the LA Auto Show. The Jaguar XE SV Project 8 has set a new record for a four-door sedan of production specification at the Nürburgring Nordschleife. The time of 7min 21.23 secs, set by racing driver Vincent Radermecker, is 11 seconds quicker than the previous fastest sports sedan around the legendary 12.9 mile German circuit. Project 8 is the most extreme road-legal Jaguar yet built. Its 5.0 litre supercharged V8 engine develops 441kW, with 0-100 km/h in a supercar-beating 3.7 seconds and a maximum speed of 322kph. 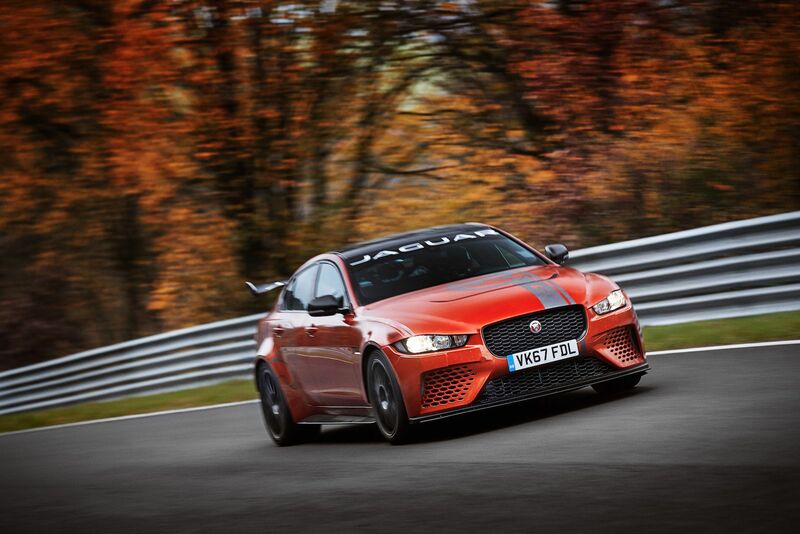 The incredible lap time places the Jaguar XE SV Project 8 ahead of some of the world’s fastest two-door coupés and mid-engined supercars around the circuit known as ‘The Green Hell’. With the most highly tuned version of Jaguar Land Rover’s 5.0 litre supercharged V8 under its vented carbon fibre bonnet, Project 8 is the second Collectors’ Edition vehicle from SVO. Hand assembly of cars destined for customers worldwide begins at SVO’s Technical Centre in Coventry, UK, in early 2018. No more than 300 examples will be created, available as a four-seater or with optional two-seat Track Pack. Jaguar Racing also announced the first Jaguar I-PACE eTROPHY race team for its new global electric racing series. Rahal Letterman Lanigan Racing, led by Team Principal Bobby Rahal – three-time IndyCar Champion and Indianapolis 500 winner – will join the grid in the world’s first production-based electric vehicle race series, starting in December 2018. The Jaguar I-PACE eTROPHY is a support series to the FIA Formula E Championship and the first to be based off of a street-legal production battery electric vehicle. Races will take place the same weekend, and on the same city street circuits, throughout the 2018-19 season. The series will exclusively feature 20 Jaguar I-PACE eTROPHY race cars, offers teams the chance to showcase driving talent and electric performance, while competing on the world stage in zero-emissions motorsport. At the LA show North America also gets a first in-the-metal look at the new Jaguar E-PACE compact performance SUV, the powerful Jaguar XJR575 flagship sedan and the stylish, spacious Jaguar XF Sportbrake. The new E-PACE is a perfectly 21st century car: connected, modern and practical, and utterly engaging to drive. On sale now, it’s beautiful to look at, fun to get to know and has a soul and integrity that can only come from Jaguar. A record-breaker itself, E-PACE performed the world’s furthest barrel roll in a production vehicle for its spectacular global launch earlier this year. XF Sportbrake returns Jaguar to the premium estate segment with a compelling combination of design, driving dynamics and advanced technologies that make it a standout performer – the perfect companion for customers with active lifestyles. Both models are available with a choice of Jaguar Land Rover’s clean, efficient Ingenium petrol and diesel engines. The XJR575 sedan is the new performance flagship for the XJ range with power up to 423kW, delivering 0-100 km/h in just 4.4 seconds. Jaguar Land Rover’s 5.0-litre V8 supercharged engine also provides 700Nm of torque, providing the fastest XJ yet with effortless acceleration and refinement. These premium vehicles with next-generation technology and the best of British design are on display at the LA Convention Center from 1 to 10 December.